3. Check your inbox for a new sign in link. Tip! There is no need to log out of your account each time. You can stay signed in. SAPS Guardrails are installed unlike any other handrail system on the market today. SAPS fall arrest anchoring system has a unique design that leads to lower labor costs at installation and removal. The SAPS product line provides solutions for both concrete and structural steel construction. The SAPS guardrail for concrete applications attaches to an embedded anchor and provides a 5000 lb point of tie-off. The 21, 42 and 60 inch models feature a permanent D-ring, rotatable rail member brackets with vise clamping and a braced base plate for maximum support. The 42 inch and 60 inch models meet OSHA height requirements. 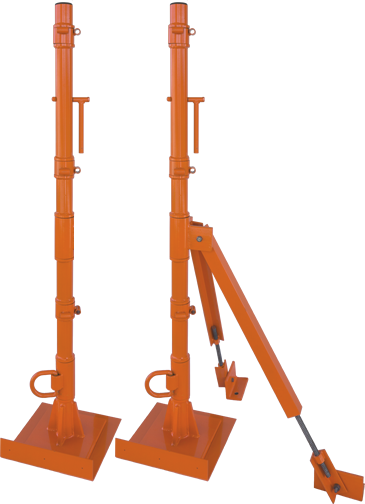 The 18 inch model features a fixed 5000 lb tie–off for one worker, a 360˚ rotatable D-ring which follows the direction of the worker and a braced base plate. It can an be used with a pre–set Spider Anchor, Dualie Anchor or Hilti 3/4" Coil Thread Drop In Anchor. No side loading. Made in the United States with heavy-duty steel, this guardrail system can be reused time over time. Installs in under a minute without the need for any tools. The SAPS Fixed Panel Barrier System is a perimeter guardrail system engineered to eliminate all wood. The system is comprised of a wire mesh panel that is supported by two SAP42DP posts and matching U-channel toeboards. 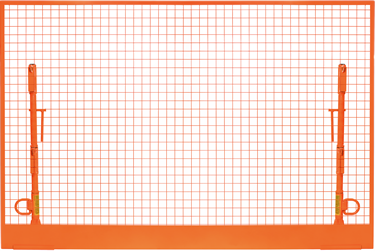 The U-channel toeboard allows the panels to slide and overlap to configure a desired span. The system does not require any gates as all of the panels are removable by unlocking the self–closing scissor clamps. 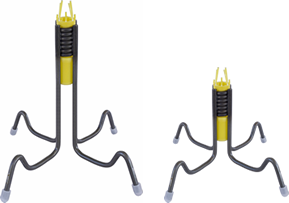 The system can be used with Spider Anchors and or Dualie Anchors. The SAP42DP surface–mount guardrail post features a 5000 lb point of tie–off for one worker, a 360˚ rotatable D-ring, scissor vise clamps to harness the panel and a braced base plate. The SAPS guardrail for concrete applications attaches to an embedded anchor and provides a 5000 lb point of tie–off. Used with wire rope cable. Featuring a permanent D–ring and a braced base plate for maximum support. Meets OSHA height requirements. Made in the United States with heavy–duty steel, this guardrail system can be reused time over time. Designed for limited space edge–of–deck concrete applications such as stairs, bridges and parapet or retaining walls. The SAPS side mount handrail bolts onto a preset embed to provide rigid support. Featuring rotatable rail member brackets with vise clamping that eliminate the need for post pockets as sleeves for post supports. 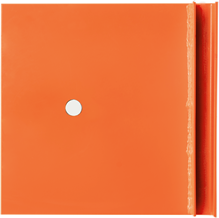 The 60 inch model meets OSHA height requirements and provides 2 3/8″ of space between the face of the wall and the post, allowing room for an edge–of–deck form. Made in the United States with heavy-duty steel, this guardrail system can be reused time over time. The SAPS guardrail for structural steel applications is surface mounted on a welded embed and provides a 5000 lb point of tie-off. The 42 inch model meets OSHA height requirements. Made in the United States with heavy-duty steel, this guardrail system can be reused time over time. The SAPS toeboard provides overhead protection from objects falling off of the edge or from potential slip and falls. The toeboard installs bewteen the anchor and post. The 14" toeboard is used with any SAPS Concrete Series 60" tall guardrails. The 10" toeboard is used with SAPS Concrete Series guardrails from 21" through 42" tall. 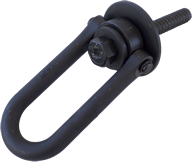 The SAPS Swivel D–Ring provides a 5000 lb point of tie–off when used in conjuction with the SAPS Dualie Anchor. 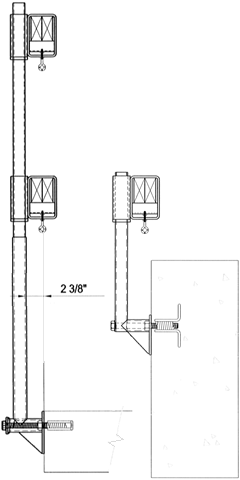 The SAPS Dualie Anchor can be used with a SAPS guardrail along with a swivel d-ring on the ceiling below. Or embed directly into a concrete wall and use up to (2) swivel d-rings at the same time. The SAPS Spider Anchor embeds directly into a concrete slab. It is used with a SAPS guardrail. 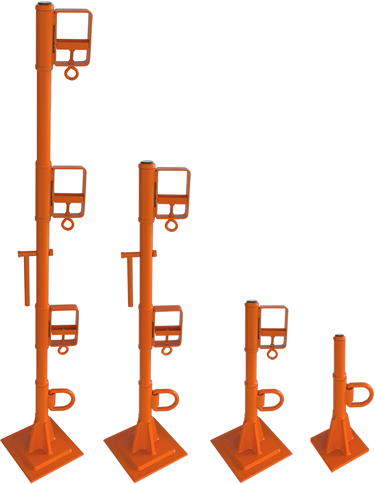 The SAPS Spider Anchor is available in 6" through 24" heights to match any slab depth. 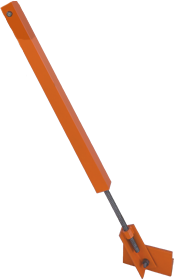 The SAPS Dualie Anchor® embeds directly into a concrete slab. 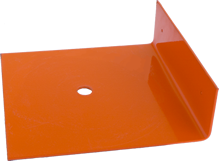 Available in 5 inch through 24 inch heights to match any slab depth. Use a SAPS guardrail along with a swivel d-ring on the ceiling below. The SAPS Dualie Anchor® can also be embedded directly into a concrete wall and used with up to (2) swivel d-rings at the same time. The SAPS Kicker Brace replacement part is used to replace the kicker brace on the SAP60DWC. 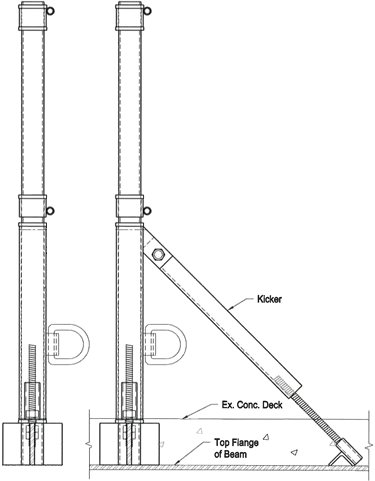 The SAPS Structural Steel Kicker Brace replacement part is used to replace the kicker brace on the SAPM42DWC. The SAPS Dualie Plug replacement part is used with the SAPS Dualie Anchor.